Vitamin K is a fat-soluble vitamin, known mostly for its role in forming blood clots. It’s pretty rare to get a severe vitamin K deficiency, it typically only happens with a malabsorption disorder or being malnourished for a period of time. Vitamin K has 2 forms, K1 and K2. K1 is found in foods, which I’ve listed on this page. While K2 is found in animal products, but it’s also produced by bacteria in your gut, so it’s not essential to get it from your diet. 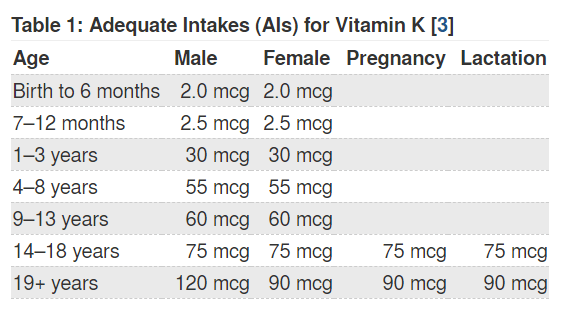 You should be aiming for 90 to 120 mcg of vitamin K per day (the RDA). It’s very easy to get this amount without trying. You can get 2+ times the RDA in a single serving of certain vegetables. To create this list, I extracted data from the USDA’s food nutrition database for over 100 whole foods that are vegan. These were the top 30 in terms of vitamin K content. The best vitamin K foods are almost entirely vegetables, with the exception of a few fruits like plantains and blackberries, and pine nuts. Any dark leafy green will give you plenty of vitamin K in a single serving. But just about any vegetable in general will give you enough to high your RDA. Have a salad every day or two and you’ll be fine.